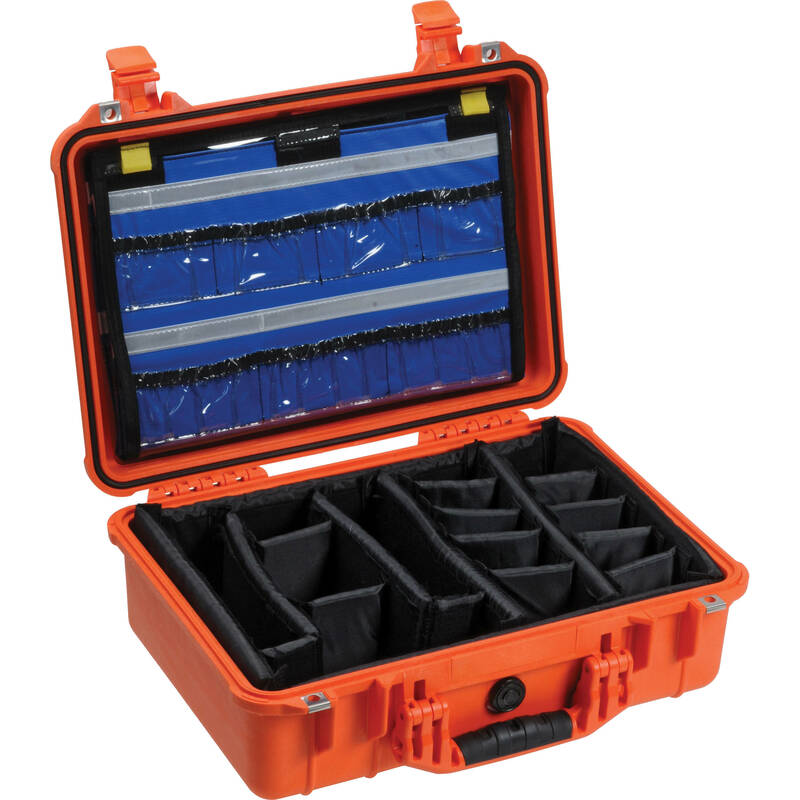 The Pelican 1500EMS Case with EMS Organizer/Dividers (Orange) is an unbreakable, watertight, airtight, dustproof, chemical-resistant and corrosion-proof hard case used to carry emergency medical supplies. It is made of Ultra High Impact structural copolymer that makes it extremely strong and durable. It includes a 0.25" (6.4mm) neoprene o-ring, ABS latches that seal perfectly, and an automatic purge valve for quick equalization after changes in atmospheric pressure. The case is NATO-codified and tested to MIL C-4150J (Military Standard), IP-67 (Ingress Protection) and ATA (Air Transportation Association) 300 specifications. This case includes a multi-layer lid organizer with a clear cover and numerous clear pockets, made to find everything right away. The lid organizer cover has touch fastener closures, to keep supplies in place during transport, and the case includes padded dividers with adjustable walls for customizing compartments to any size. Box Dimensions (LxWxH) 18.6 x 15.5 x 7.4"
1500EMS Watertight ATA Hard Case with EMS Organizer and Dividers (Orange) is rated 4.8 out of 5 by 17. Rated 5 out of 5 by PDX Rafter from Fantastic Case! If your looking for way to really organize medical supplies for work or extended outdoor adventure this is a fantastic case. It really allow for organizing the small supplies like band aids, bandages, tweezers, etc in the top of the case and gives ample space for larger items like splints, cleaning solutions, medications, etc in the bottom compartment area. The velcro movable dividers keep things organized and help keep them from shifting during transport. It has plenty of space for all the supplies that are required for a major medical kit that are required on white water rafting trips such as the Grand Canyon. Rated 4 out of 5 by joesan from Good product... Purchase intended to serve as our family's first aid box. Turned out to be somewhat small for what I was hoping could fit inside. Even though we managed to fit everything in, basic first aid consumables plus a wrist blood pressure monitor, ear thermometer, and the rest of unusual pills and ointments, also a bottle of alcohol, betadine, and a couple of elastic bandages....Very hard case, a little heavy for the purpose it is serving, but I'm planning to use it as a hard case for an underwater camera set in my next diving trip as well. Could not find a better price/quality option.If you don't mind carrying a little bit of weight to protect your gear or first aid stuff, definitiely go for it! Rated 5 out of 5 by Alex the survivor from Better to have it and not need it.... I purchased the Pelican 1500EMS case so that I am able to keep a fully stocked first-aid/emergency response kit for my home and when traveling to outdoor family sports/adventures. The best thing about the pelican It is great compared to conventional first-aid kits because it keeps all of its contents fully dry and secured. Aside from providing added protection, the foam dividers maintain item organization, which is key during emergency situations. I highly recommend this product. Rated 5 out of 5 by Nurse at work from Best case for organizing supplies The cases are being used for emergency first aid supplies along side our AEDs in a manufacturing setting. Best features are case durability and multiple compartments with the capability to customize compartment size for specific needs. Clear plastic compartments great for small items and allow for rapid ID and retrival. The main disadvantage is it's weight. Overall very pleased with product selection and ease of ordering/delivery. Rated 5 out of 5 by fred s. from perfect first aid box i do a lot of back country camping, 4x4 and motor cycle riding in remote areas of the rocky mountains and utah. seems like there is always something that needs attention and usually in a hurry. stocked it up with what i had plus some other stuff, and it works great. every thing in one place, dry and secure. every thing fits perfectly, even 36 inch splints. now i have every thing ready to go when camping and transfer back to the big truck when it's time to roll 18 wheels again. no more plastic tackle boxes and tool boxes that always get wet or dump your stuff out on the ground when you pick them up, or digging around looking for what you need. all organized and easily to inventory. pelican cases are the best, hands down. i trust them for all my camera equipment and my fire arms when transporting to the field. the color is great. makes it easy to recognize from the other cases. Rated 5 out of 5 by Albert from Great case I love all pelican cases and this is no different. Designed to hold up the most extreme situations, this case does not disappoint. I am using this case as a first aid kit and works beautifully. Only issue was on one of the screws holding up the lid organizer allowed the material to pull through. It's an easy fix with a washer to allow for more surface area. I will be buyer more of these. Rated 4 out of 5 by cmamarun from Great Case for EMS Field Work This is a great case for ALS meds in an ambulance or non clinical setting. A full complement of cardiac meds can fit into the case, as well as an IV set up and extra needles and syringes. We've had cases drop over 20 feet and have the contents, even glass, remain intact. This is the only case we use for our off site/remote locations. Rated 5 out of 5 by Swansailor from Great case We bought this case to replace an ancient soft pack for our EMS equipment aboard our offshore sailboat. The fact that it's waterproof & rugged is a major plus given the environment it lives in. The additional lid storage will make it easy to organize drugs & small equipment. I can't think of any downsides although it is heavy.